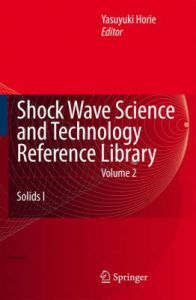 This book is the first of several volumes on solids in the "Shock Wave Science and Technology Reference Library". This is a unique collection, and the library as a whole sets out to comprehensively and authoritatively cover and review at research level the subject matter with all its ramifications. All the chapters are self-contained and can be read independently of each other, though they are of course thematically interrelated.